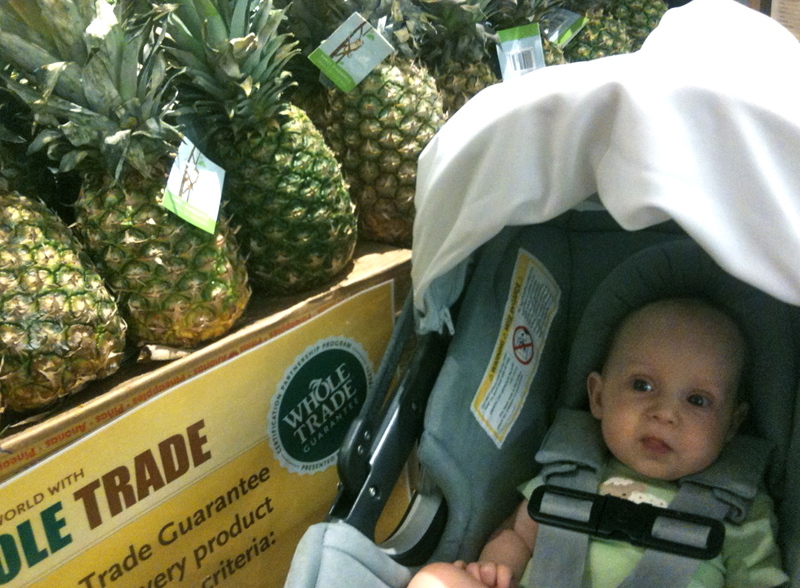 Since Kamea was born, Greg has been doing the food shopping. He’s done an amazing job – yay Greg! This week, as I wrote our shopping list, I realized that we had a lot of food to buy. I thought it might be better if I went, too. This meant Kamea was going, too. Ever since Kamea turned 12 weeks, I’ve been feeling more confident about taking her out on little adventures (read about our first adventure here). We took her car seat, stroller (car seat attaches to it), and my ERGO baby carrier. I was unsure of how she’d be, so I thought it was best to have all of our bases covered. I took the stroller because car seats are not designed to be put on grocery carts – dangerous – that makes sense to me because they always look like they’re ready to topple over. I wasn’t sure that Kamea would want to be worn the whole time either, since the longest I’ve worn her around the house in our ERGO or Moby is about 20 minutes or so. Therefore, we took everything – lol – just in case. Kamea is chilling out by the organic apples. As I thought… Kamea didn’t last long in the stroller. 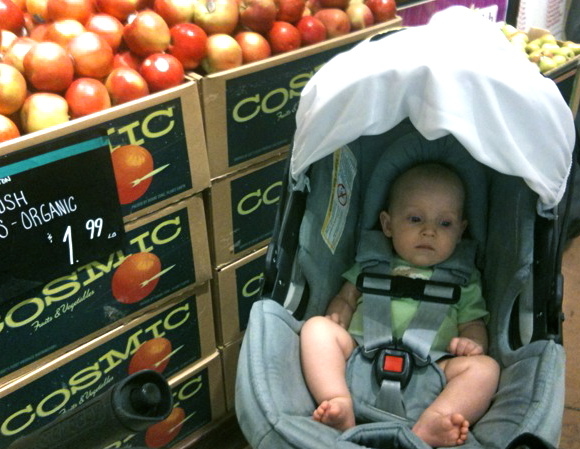 By the time I was checking out goodies in the Raw Food aisle, she was ready to use the ERGO. With Daddy there to help, it was a team effort (so glad he was there). Fun, too! It was a lot of stimulation for her – especially it being her first trip. Plus, Whole Foods was playing AC/DC’s Back in Black. Maybe if they’d been playing The Wheels On The Bus (go round and round) she would’ve done better – lol. All in all, Kamea did great, even if she did fuss/cry a couple times. All we had to do was change her from stroller to ERGO to stroller to ERGO and she enjoyed it.